Farina used to mean Cream of Wheat to me. That was before tasting Farina Cake at All Spice Deli, in downtown Portland. The sweet, grainy cake, topped with an almond, is a lot more appealing than the cereal I loathed. Still, my favorite is baklava. The light pastry, layered on chopped nuts and dusted with chopped pistachios, is flaky, honey-sweet and messy. Don’t try eating it while driving. As usual, I’m putting dessert first. Back to the lunch itself. 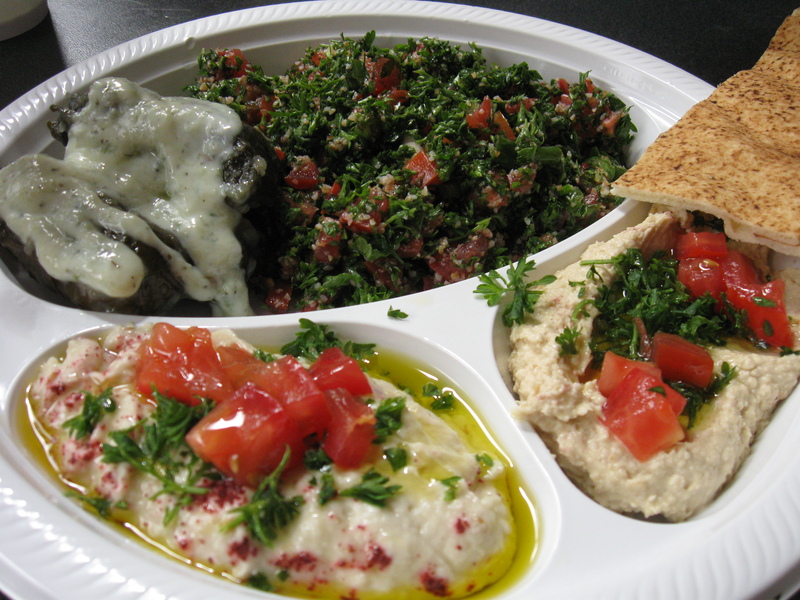 Lebanese food is prepared in the deli kitchen from scratch, in small batches with fresh ingredients. Everything on my tray, chosen from the display case, is loaded with flavor: creamy baba gannouj, sprinkled with the beet-red powder of summac berries; tabouli; rich hummus; and dolmathes, filled grape leaves with cucumber sauce. Also a dish of dandelion leaves on spicy rice with lentils. This entire meal, which includes pita bread and hot lentil soup with Swiss chard, comes to $15 for two of us. (My daughter and I are shopping today and need sustenance.) There are plenty of leftovers for tonight’s dinner. 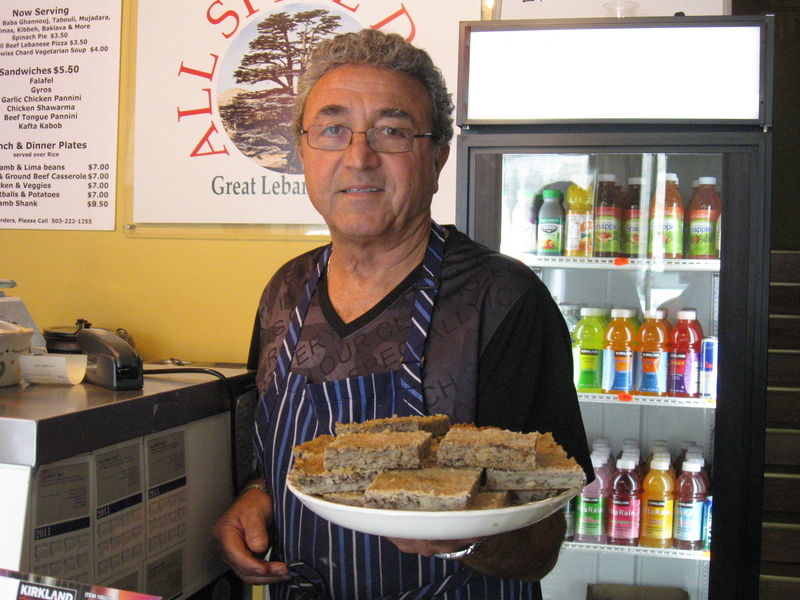 The deli’s owner, Eddie Attrash, came to Portland from Lebanon in 1970. He goes back to visit fairly often, but he’s busy here with two businesses–he also owns a service station–and family. He opened All Spice in late 2010 because he loves to cook for people. “It is my yoga, my passion,” he says. His enthusiasm shows in the quality of everything I’ve tasted, and there’s much more. For $5 you can buy garlic chicken or beef tongue panini, gyros, kabobs, and other sandwiches. Lunch and dinner plates, $7, are generous servings of roasted lamb, eggplant and beef casserole, kafta meatballs, and curried chickenand veggies. I’ll try one of thos next time. I hear the lamb is tender and perfectly done. 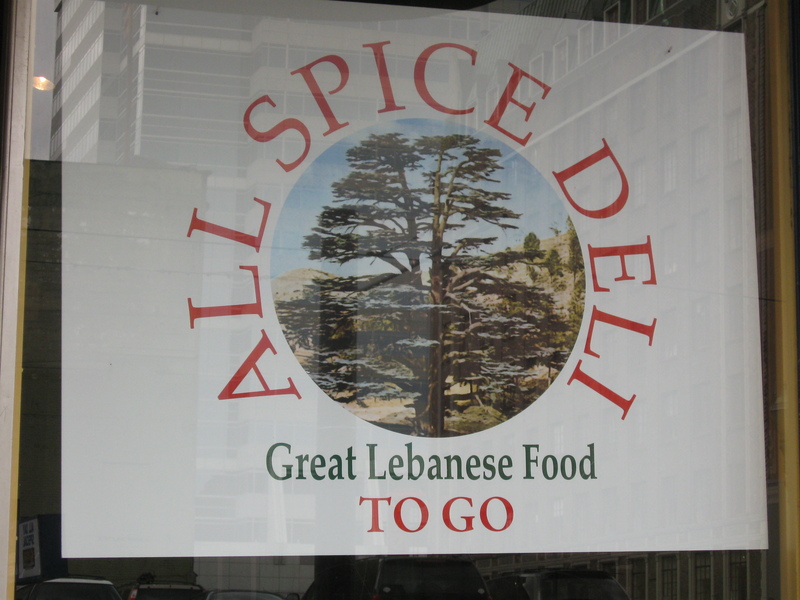 All Spice Deli is small and plain, with only a few tables. Customers stream in to order takeout, because the neighborhood has discovered the place. The deli is at 911 SW 10th Ave., Portland, Oregon 97205. 503-222-1255. Hours are Mon-Fri 11 am-8 pm and Saturday noon to 5. The Proctor District is the oldest part of Tacoma, Washington, but it’s new to me. I’ve been changing my views of this port city on Puget Sound, which I used to think was just a gritty sawmill town–and worse, boring. That’s not Tacoma now. 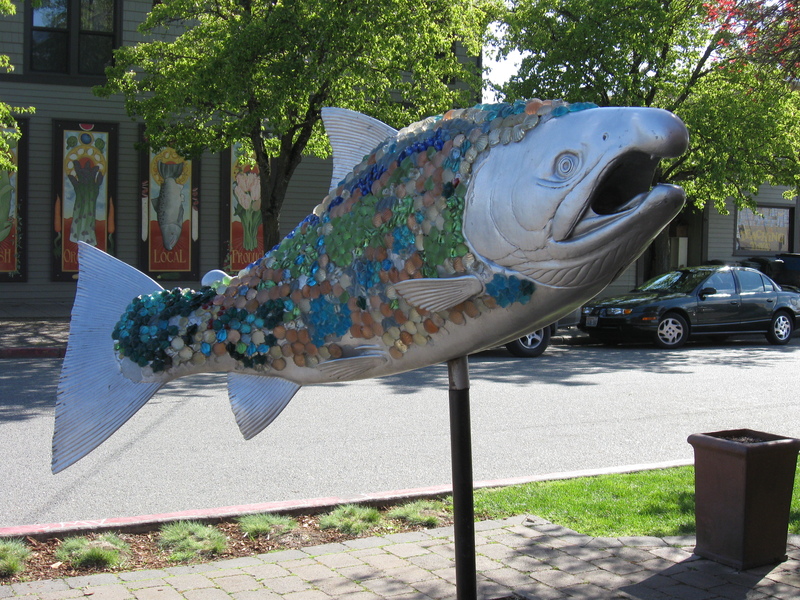 It’s a vital place, and one of its attractions is is this hilltop neighborhood, where my friend Terri and I are strolling quiet, leafy streets and admiring the views of Commencement Bay, well-kept traditional homes, and a cluster of cafes and shops. We only get a glimpse, but it’s enough to bring us back. Art is a big deal in Proctor. The annual summer arts festival draws crowds for its art displays, sidewalk sales, entertainment, demonstrations, even a doggie fashion show and parade. I’d come for that alone. We get a good look at locals artists’ works in Proctor Art Gallery, a showcase of watercolors, oil and acrylic paintings, pottery, glass, and other media. The artists help staff the gallery, each coming in twice a month. If I’m looking for a uniquely Northwest souvenir, I might check out the Pacific Northwest Shop. The Blue Mouse Theatre is a treasured bit of Tacoma history. Built in 1923 and renovated with style, it’s the oldest movie theater in the state still in operation. It shows movies daily, and the Rocky Horror Picture Show twice a month, on Saturdays. Also on Saturdays, April through mid-November, there’s a sizable farmer’s market in the district. This isn’t a Saturday, so Terri and I venture into Metropolitan Market. We happily sample our way through this big, lively place where vendors sell high-quality meats, flowers, 90 kinds of breads, 1200 types of wines and beers, cheeses galore, produce, and pastries. We buy a treat or two and head out to see a few of Proctor’s eateries. The Old House Cafe, in (no surprise) a charming old house, serves highly praised American food; Pomodoro’s is casual Italian and has outdoor seating in summer. Europa Bistro specializes in Italian cuisine and wines. Babblin’ Babs Bistro’s menu shows some intriguing combinations I’ll try on the next visit; roasted trout with pecan rice and asparagus sounds appealing. At Pour at Four, a wine bar, Terri and I peer in the window and wish it were open so we could taste the tapas, or maybe the Dungeness crab cakes, which I hear are a big favorite, and sample a few Northwest wines. That’s another time. We’d like to try Jubilee Cupcakes and Vintage Candy, too if only to taste a bacon or champagne cupcake. 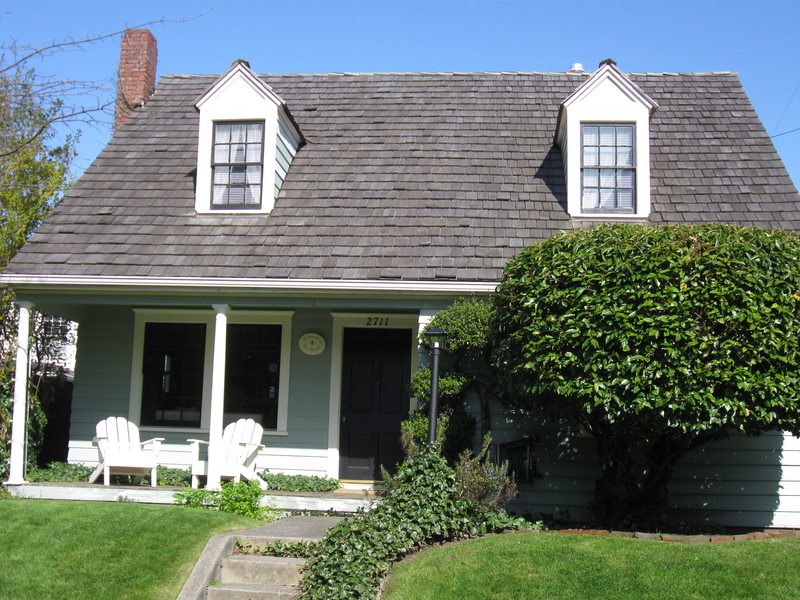 Our bed-and-breakfast, Green Cape Cod B&B, is run by Mary Beth King, who has years of experience in the hospitality business. Her comfortable home, a short walk from Proctor shopping, has 3 guest rooms with private baths, down comforters, fluffy robes, and bedside chocolates. 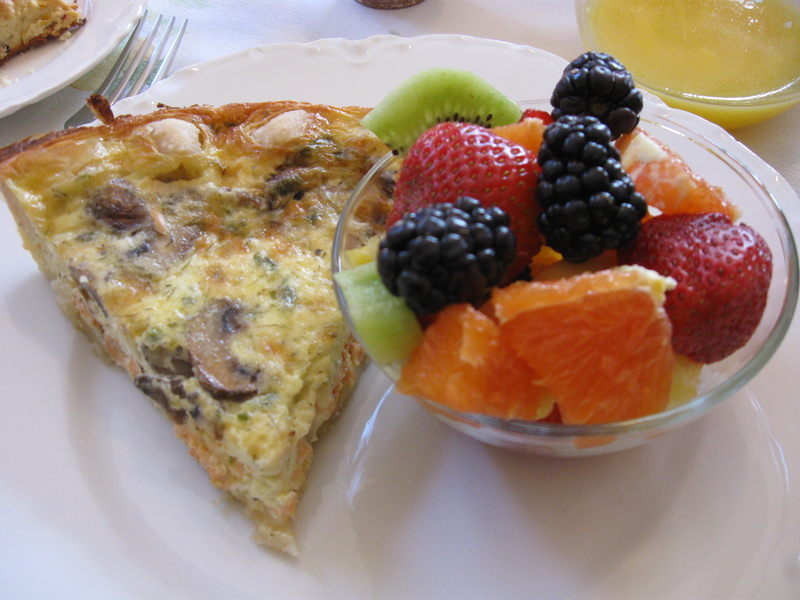 Our breakfast, in the sunny dining room, happens to be a perfect salmon quiche, and since Mary Beth generously gave us the recipe, I’m happy to share. Preheat oven to 350 degrees (convection oven, 325). Melt 2 T butter, add 1/2 t dill, lemon juice, and Worcestershire sauce. Spread over salmon and bake 20 mins. Let salmon cool; flake into large pieces. Spread 1 T butter on pie crust. Mix together cream or half-&-half, eggs or Egg Beaters, and salt. Stir in cheese, set aside. Melt 2 T butter in skillet. Add onions and mushrooms and saute until tender. Add to cream mixture. Add 1/2 t dill and pepper. Pour into pie crust. Bake at 425 degrees for 15 minutes, then 325 for 35 minutes. (Convection oven: 400 deg. for 15 mins, and 300 deg. for 35 mins.) Quiche is ready when knife inserted in center comes out clean. There are two tantalizing stories in the airline magazine on the plane to Maui that grab me: one about the newly emerging bluegrass scene, the other a write-up announcing the annual Hawaiian Steel Guitar Festival. Oh boy, what lucky timing. 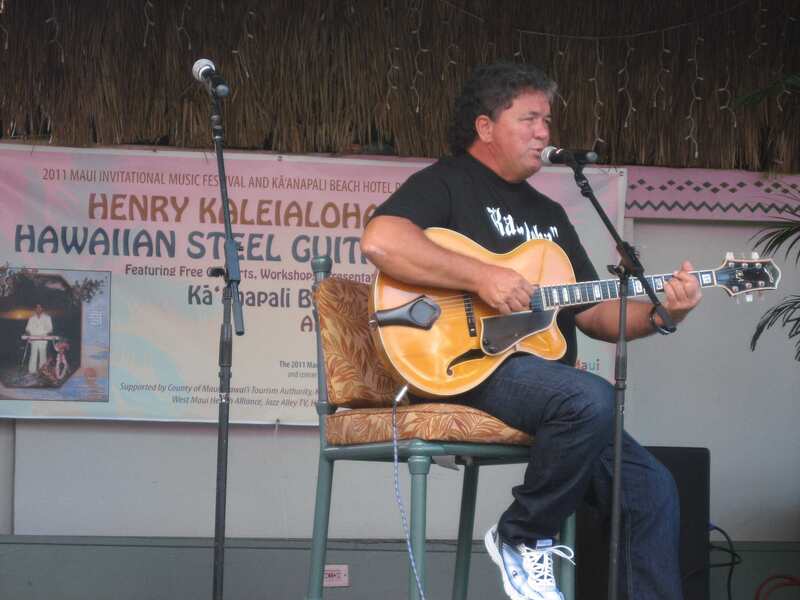 During my stay on the island, I can hear a celebration of music created on the Hawaiian steel guitar–featuring Henry Kaleialoha Allen, one of the kings of the genre–and some bluegrass jamming on the beach. It doesn’t get better than that. The festival is being held at the Ka’anapali Beach Hotel, known as “Hawaii’s most Hawaiian hotel,” committed to maintaining a genuine Hawaiian cultural experience. The hotel made National Geographic‘s list of 150 truly authentic and sustainable resorts. I walk from the place I’m staying and find myself in a soft universe with one big pool–shaped like a whale–and acres of green lawn dotted with grass umbrellas and lawn chairs. People are making leis out of flowers and seed pods, local folks are tuning up instruments and drinking beer at the Tiki bar. 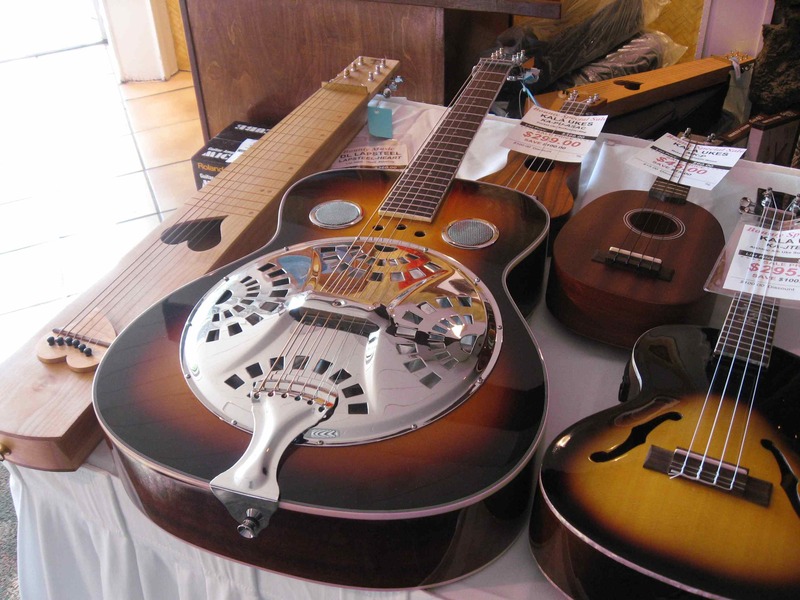 Steel guitars, metal-bodied Resonators for playing rock and roll and the blues, even ukuleles are for sale. As well as some types of guitars I’ve never seen before. 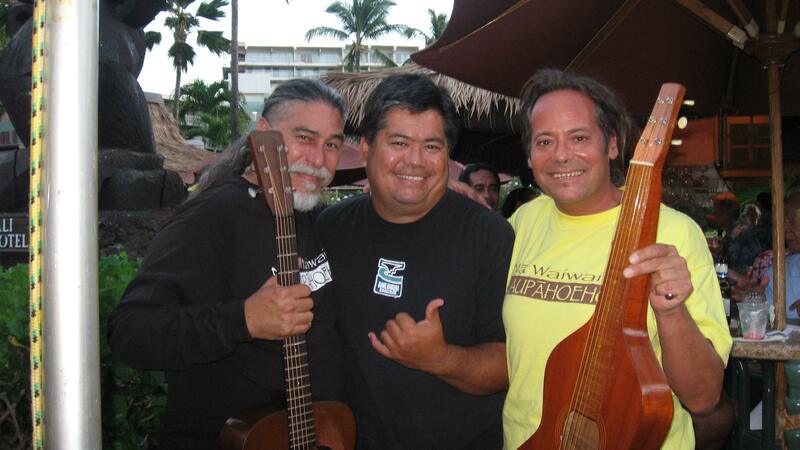 It isn’t a big stretch from the lap slide steel, dobro and pedal steel guitars, associated with country music and bluegrass, to Hawaiian music and vice versa. Playing a guitar laid flat and using a bar to slide up and down the strings has been done on the islands for a very long time; the first musicians probably used whatever they could get their hands on to slide up and down the neck of the guitar–a hollow or solid metal bar, a metal tube, a knife edge–hence the name “steel” guitar. It makes the distinctive fluid tones that many love and drive others crazy. The formal lineup for the festival starts late: the major is here, other dignitaries too, and they want to talk about all the things dignitaries like to yak about. But there is no stopping the jamming all around the edges. And to my surprise, when the musicians come on, they are more jazz than Don Ho, more Yoshi’s than Blue Hawaii. This is Hawaiian Fusion–a little Appalachia, a little Aloha. And the crowd is about as mellow and welcoming as you would expect on a warm, sweet night with the fragrance of plumeria, tuberose, and orchids in the air.